She was the most eligible woman in all of England – Elizabeth Tudor, daughter of the great King Henry VIII and his ill-fated second wife, Anne Boleyn. So I’ve been researching Thomas Seymour off and on for the last two years, but have really focused on him in the last year. To many of you I’ll sound like a broken record, but those who are new here: I’m fascinated by Thomas Seymour. I guess, maybe you could say there is a part of me, in his story? I can relate to him in some ways. I guess, that may be one of the many reasons I feel so strongly about the slander surrounding his name. Thomas Seymour made some bad decisions. Been there. Not judging. But to look at his story from the aspect of “giving him a voice” or “letting Thomas tell his story”. So, because of that, I’ve collected nearly every book that might have any mention of his name – including nearly every book on Elizabeth. I’ve read every piece correspondence I could find and lastly what other people had to say about him, over time. My favorite part of Thomas Seymour’s story is how he finally ended up with Kateryn Parr, after four years apart. I mean, come on – how can you not see the romance in their story. Two “lovers” torn apart by the aging and obese king of England, only to reunite almost immediately after the king’s death. Then, they have a love child, only for Kateryn to die and Thomas nearly go mad with grief. I guess I’m a sucker for happy love stories that end tragically. Whoa, like really tragically – Kateryn died in 1548, less than a year later Thomas is executed and then their daughter Mary died young (more than likely). They finally got everything they wanted, only to have it all destroyed a year later. So sad. Tragic. But a great story! Okay, back to the serious stuff. (But no really, I’m obsessed with Thomas). My constant research of Thomas Seymour has led me on an unexpected journey to discovering the young Elizabeth Tudor. Thomas played an important role in Elizabeth’s time during her guardianship with Kateryn Parr. From those who read my blog often you know that I tend to write mostly about the reign of Henry VIII. Don’t be judgy now…Henry VIII is where I started my curiosity and research, so he has a special place in my heart. I will also defend Henry VIII if he’s being unjustly slandered. I mean, c’mon, the guy reigned for 38 years…they weren’t ALL bad! 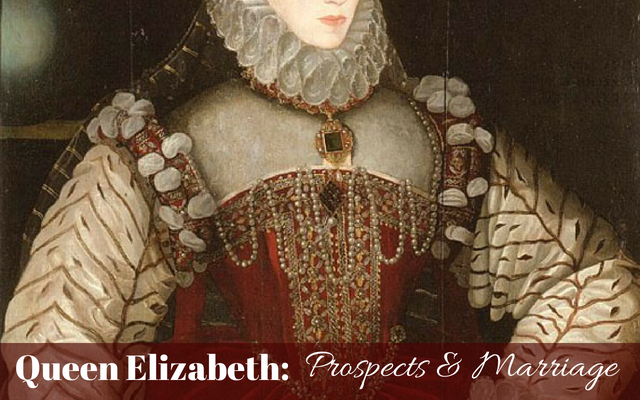 Anyway….I’ve never professed to be an expert on Elizabeth Tudor, Princess Elizabeth, Lady Elizabeth and Queen Elizabeth, but here I go – giving my opinion on her and talk about some of her marriage prospects. This should be fun. Born on the 7th of September 1533, Elizabeth was not the son that her parents had wanted, or expected. From the beginning all of the royal physicians and astrologers, save one, had predicted that Anne would indeed have a prince. Nevertheless, Elizabeth had a splendid christening that was fitting a princess. As far as her life prior to her mother’s execution, I think I can confidently say that Elizabeth had little memory – just as you and I don’t necessarily remember what happened when we were two and a half years old. My son was three years old when his father and I finally married and while he remembered it for a few years after, now at 14 he doesn’t remember it at all. The same can most definitely be said for Elizabeth. She wasn’t anywhere near her mother at the time of her swift downfall, she was at Hunsdon House in Hertfordshire. Today, Hunsdon is 36 miles by car to London. One can wonder if Elizabeth remembered Jane Seymour at all. She would have been only four years old – so again, it is quite possible that she had no memories of Jane. Maybe she remembered no longer being called “princess” – she said something to one of her servants to the effect: Why Princess yesterday but Lady today? That must have been a traumatic event in her life – if she was to remember anything you’d think it would be that. But now I’m just speculating. Historian David Starkey states in Elizabeth – The Struggle for the Throne that “there is no evidence that Elizabeth met her father’s fourth wife, Anne of Cleves, during her six months of marriage to the King.” But we do know that they knew each other after. We know for a fact that during Queen Mary’s coronation procession Anne was front and center in the first chariot following the Queen. She was, after all, a very prestigious member of Tudor court and shared the chariot with the Lady Elizabeth, the heir to the throne. After the death of Henry VIII, Anne of Cleves had seen her status diminished, but that did not stop Elizabeth from visiting her former stepmother. Anne had established her household at Hever, which must have been comforting for Elizabeth to be there, near memories of her mother. It was there that she would catch up with Elizabeth to find out what was going on at court in the realm. It was Katheryn Howard’s marriage to her father that most likely had the deepest impact on her future outlook on marriage. I recently read that after the execution of Katheryn Howard that Elizabeth told her sister Mary that she would never marry. Now, please forgive me because I cannot recall which book it was but it was most likely, The Wives of Henry VIII by Antonia Fraser or The Temptation of Elizabeth Tudor by Elizabeth Norton. I was surprised when I read it because it was also a scene is Showtime’s The Tudors. Robert Dudley had also been reported as saying that Elizabeth told him at the age of eight that she would not marry – both instances may have coincided with the execution of Katheryn Howard. When we move forward to the woman I would consider her favorite step-mother, Kateryn Parr, we see a woman who had a great influence on Elizabeth. Katheryn was like the mother that Elizabeth never had and she encouraged Elizabeth to study what she believed to be her mother’s faith – the Protestant faith. Nowadays, many historians and authors are quick to say that Anne Boleyn was a Reformist and not a Protestant. Anne wished to see changes in the church but before her death was concerned at how far Cromwell was taking those changes. She wanted more of the money from the monasteries to go to charity and not to the King. When I think of young Elizabeth I am often reminded of how she must have felt…no mother, a father who had declared her illegitimate and practically abandoned her for many of her formidable years and English subjects who had looked at her only as the daughter of the “Great Whore”. It all seems so unfair by today’s standards. These things made Elizabeth the person she later became, just as our own pasts have made us into the people we are today. After the death of her father, King Henry VIII, Kateryn Parr took Elizabeth into her household – something Elizabeth would have been extremely happy about. It is while in that household that young Elizabeth experienced her first crush. Thomas Seymour was a very attractive man with a lot of charisma. Elizabeth’s attraction to Thomas Seymour is unmistakable. He was considered an attractive man who was easy to like – Elizabeth, like any young lady, enjoyed the attention she received from him. My gut tells me that it was his proposal to her (soon after her father’s death) that initially ignited the flame. When Kateryn Parr caught Elizabeth and Thomas Seymour in an embrace she was livid. What exactly is meant by “embrace” is unclear – whether it was merely a hug between the two is uncertain, but one could assume it was more than hug. I know this isn’t popular opinion but I get the impression that Elizabeth kissed Thomas and he didn’t pull away – letting her teenage hormones get the best of her. Unfortunately, by succumbing to her feelings she temporarily severed her strong relationship with the woman who meant so much to her, Kateryn Parr. Fortunately, Kateryn was smart enough to know that the prudent thing to do was to send Elizabeth away. The only people who knew about the embrace were Parr, Seymour, Elizabeth and Elizabeth’s governess Kat Ashley whom Parr told. In order to protect Elizabeth’s reputation she wrote Kat Ashley’s kin, Sir Anthony Denny and his wife (Kat’s sister) Joan to invite Elizabeth into their home. This was to cover up the fact that Kateryn Parr wished to separate her from her husband. Even Elizabeth’s cofferer, Thomas Parry could not remember if Elizabeth “went of herself, or was sent away”. Word began to spread of the “affair” and speculation arose that Elizabeth was pregnant with Seymour’s child. These rumors were compounded by the fact that Elizabeth who, now housed with her new wards, became ill and took to her bed. This was once again, like so many times in her youth, an example of how Elizabeth’s health was associated with traumatic events in her life. These rumors became so bad that Elizabeth felt the need to write the Lord Protector (Edward Seymour) to tell him that she had heard the rumors and would like to come to court to prove them wrong. So, all that was just a taste of what she experienced in her youth. In 1558, after the death of her sister, Queen Mary, Elizabeth Tudor became Queen Regnant of England. A childhood filled with uncertainties turned into Elizabeth being on the throne of England. Once there she would not do anything to jeopardize it and the future of her country. Almost immediately after taking ascending the throne, Elizabeth’s council began to encourage her to marry…to take a husband. The Tudor dynasty was in desperate need of heirs. Elizabeth had deeper reasons for being reluctant to marry, primarily the fear of losing autonomy as Queen. She understood that she was regarded as holding supreme dominion over England, while in the 16th century a husband held dominion over his wife, even if that wife was the Queen of England. This was something her sister Queen Mary struggled with as well. Then if you add children into the mix: Elizabeth would be out of commission for most likely months (during each pregnancy) while others ran HER kingdom. “I will have but one mistress here and no master,” she told the Earl of Leicester, the man she loved more than any other and to whom she was close for over 30 years. Many believe that the only man Elizabeth would have trusted enough to wed was Robert Dudley. Dudley was a lifelong friend and someone who most believe would not have tried to rule over her. Unfortunately, that union would not happen for Elizabeth. Dudley was married to Amy Robsart at the time and the only way to wed Queen Elizabeth is if Amy was not in the picture – well, we know what happened there. Robert Dudley married Amy Robsart in 1550, merely ten years later, on the 8th September 1560, Amy Robsart insisted that all her servants be away from the household that day. There was a local fair going on. When Amy was found dead at the bottom of her staircase with a broken neck Robert Dudley was immediately a suspect; however, he was vindicated because he was at court with Elizabeth at Windsor Castle. An investigation was carried out and found the cause of death to be accidental but this did not remove suspicion from Robert and Elizabeth. It was too convenient. For Elizabeth to be able to marry Robert, Amy could not be in the picture. Whether this was declared an accident or not Elizabeth could no longer consider Robert a husband. It would ruin everything she had worked so hard to build – her position as Queen Regnant. There is no doubt that Elizabeth loved Robert Dudley. Unfortunately he would not wait forever for the queen to propose. Robert remained unmarried after Amy’s death for 18 years. When he eventually married again, in 1578, it was to Elizabeth’s cousin, Lettice Knollys. Elizabeth was crushed and saddened by the fact that her love could marry anyone but her – let alone her beautiful cousin….and without her permission. Philip was married to Elizabeth’s sister, Mary. As we know, Mary was Queen of England from 1553 – 1558. After her death Philip continued to support England and even attempted a union with his dead wife’s sister. Elizabeth delayed making a decision on the proposal and had learned that Philip was also considering a marriage with the Valois family in France. Elizabeth, we believe, would not have married a Catholic. The problem with this marriage stemmed with Elizabeth’s legitimacy and her faith. In the eyes of the Catholic church Elizabeth was illegitimate since the Pope did not recognize the divorce of Katherine of Aragon and her father, Henry VIII – thus the marriage of her mother Anne Boleyn to Henry VIII was invalid and she was illegitimate. Or at least Elizabeth would have been considered to be born out-of-wedlock in 1533 since Katherine of Aragon didn’t die until January 1536, making her parent’s marriage legit. Agnes Strickland states that Elizabeth always kept the portrait of Philip by her bedside, as a token of regard – but in all reality, she goes on to say that it was probably still there when Elizabeth took possession of her sister’s apartments. James was a Scottish nobleman whose father was a short-lived regent of Scotland, after the death of King James V. Mary Queen of Scots was queen at only 6 days old and she obviously couldn’t rule on her own and so required a regent. Historian Agnes Strickland states in her book, “The Life of Queen Elizabeth” that Henry VIII had also proposed marriage between his daughter and James Hamilton, then heir to the earldom of Arran. So this was not the first time Arran’s name came up in the marriage game. James’ father proposed marriage between Elizabeth and his son in 1558 in effort to cement the relationship between Scotland and England. In 1559, both James and his ex-regent father declared themselves Protestants – James seems like he would’ve be an attractive choice to the Protestant Queen Elizabeth. This would, of course, be a political alliance. “Wishes she should honourably and graciously receive the Earl of Arran in her Court; “giving him as good hope as any other, for if he be the same that they here report of him, he is as well worthy as any other;” and give such orders that his being in England be most secret, so that the French catch no apparent occasion to say that she does not keep her treaty. The French Ambassador should have no knowledge where he is; for he will press her to apprehend him.” ‘Elizabeth: August 1559, 21-25’, in Calendar of State Papers Foreign: Elizabeth, Volume 1, 1558-1559, ed. Joseph Stevenson (London, 1863), pp. 490-501. British History Online http://www.british-history.ac.uk/cal-state-papers/foreign/vol1/pp490-501 [accessed 12 July 2018]. The Earl of Arran made a visit to England (and presumably a secret meeting with Elizabeth at Eltham Palace and there is good reason to believe that William Cecil worked hard at attempting to unite the crowns of England and Scotland with this possible union. The Hamiltons were attempting to depose Queen Mary of Scotland and replace her with the Earl of Arran. He was backed by the famous John Knox, as was a marriage with the Queen of England. Of course this was the last thing the French wanted – Scotland had been their ally and they didn’t want to lose the power that came with that. Hence a secret meeting. Arran was considered young and handsome, but also weak-minded. There were times that he was subject to the direful malady which clouded mental perceptions of his father and brother. When Arran went back to Scotland he was joined by two English escorts: Thomas Randolph and Sir Ralph Sadler (both considered Earl of Arran a friend). They reported that he had signs of mental instability. Now, I’ve looked and looked through letters and papers to find exactly what they said to indicate mental instability and was unable to find it. Without knowing EXACTLY when they said it proves difficult to find the documentation. Elizabeth formally declared her rejection of his suit on 8 December 1560. Henry Fitzalan was born around 1512, in London. He was a prominent Lord during the reign of Henry VIII, Edward VI, Mary I and Elizabeth I. It was during Elizabeth’s reign that he was the premiere earl of the realm. In January 1559, Arundel was elected Chancellor of the University of Oxford. After only four months as Chancellor he resigned the office – most likely due to religious motives. Elizabeth visited him at Nonsuch Palace in August 1559. For five days she was entertained with banquets, masques, and music. She visited Nonsuch and Arundel many times after. Was Elizabeth deciding if a marriage with Arundel was suitable? As a widower Arundel was named as a suitor who might aspire to the Queen’s hand. Apparently in 1561, this news led to a fight between himself and Robert Dudley. At this time Dudley’s wife had died a year earlier and Dudley was free to marry again. Was he jealous? Sir William Pickering was born in 1516, and was an English courtier and diplomat. …being ‘a brave, wise, comely English gentleman,’ was seriously thought of as a suitor for Elizabeth’s hand. In 1559 ‘the Earl of Arundel … was said to have sold his lands and was ready to flee out of the realm with the money, because he could not abide in England if the queen should marry Mr. Pickering, for they were enemies’ (Cal. State Papers, For. Ser. 1559–1560, p. 2). At one point it was reported that William had secret visits with the Queen and he had taken up residence at court. He was known to entertain lavishly and showed great tastes. The Earl of Arundel was said to be jealous of William, as his rival suitor, and challenged the 2nd Earl of Bedford to a duel for having spoken ill of him. The truth is probably that Pickering never considered himself a suitor. He was recorded as telling ambassadors that the Queen (Elizabeth) ‘would laugh at him and at all the rest of them as he knew she meant to die a maid’. Born to Gustav I of Sweden and his wife Catherine of Saxe-Lauenburg on 13 December 1533 in Stockholm, Sweden, Eric ruled as King of Sweden from 1560 until he was deposed in 1568. He had sought to improve his reputation by securing a marriage with Queen Elizabeth. Eric courted Elizabeth for years – he even sent her love letters written in Latin. He also went so far as to send his brother to English court, where he “scattered silver like a shower of falling stars in the London streets, and told the crowds that whereas he scattered silver, his brother would scatter gold” (according to John Sitwell). Eric XIV, the King of Sweden, sent Elizabeth a portrait of himself, making his interest for her hand in marriage known. Elizabeth seems to have slowed her courtship with Eric intentionally, but King Eric was never deterred. He was determined to wed Elizabeth. It wasn’t until the rumors of Elizabeth and Robert Dudley that the King started to become upset and even challenged Dudley to a duel. The duel never happened as King Eric was “talked off the ledge” by his envoy. Eric gave up in 1560 when he had to return to Sweden, from a trip to England, because his father had died. This letter gives you a good insight into what Elizabeth was thinking and already aware by saying “we have never yet conceived a feeling of that kind of affection towards anyone”. She knew already that there was no man she would marry. Adolphus of Gottorp was born the third son of King Frederick I of Denmark and his second wife Sophie of Pomerania in 1526. Adolphus of Gottorp, Duke of Holstein was thought of highly enough in England to be made a Knight of the Garter in 1560 to fill the vacancy left by Francis Talbot, 5th Earl of Shrewsbury after his death. While Elizabeth was yet amusing herself with the addresses of the royal Swedes, — for there can be little doubt that Eric’s jealously of the brother, who finally deprived him of his crown, was well founded, with regard to his attempts to supplant him in the good graces of the English queen — the King of Denmark sent his nephew, Adolphus Duke of Holstein, to try his fortune with the illustrious spinster. He was young, handsome, valiant and accomplished, and in love with the queen, but though one of the busy-bodies of the court wrote to her ambassador in Paris, “that it was whispered her Majesty was very fond on him,” he was rejected like the rest of her princely wooers; she, however, treated him with great distinction, made him a Knight of the Garter, and pensioned him for life. Four years later, the Duke married Christine of Hesse and they had roughly ten children together. Henry was the son of King Henry II of France and Catherine de Medici, born in 1551. There was a point when Charles IX of France was suggested for Elizabeth’s hand before it was realized that neither monarch was willing to leave their country. That is when the younger brother, Henry (Duke of Anjou) was suggested. In 1570, Catherine de Medici wanted her son with to marry the Queen of England. However, Henry would hear nothing of it. He insisted that Elizabeth was too old for him, plus she was the daughter of a Protestant – not to mention the fact that he considered her illegitimate. In addition to those objections he wanted to steer clear of the drama regarding Elizabeth and Robert Dudley’s “affair”. In 1559, and again from 1564–1568, there were negotiations for a marriage between Charles and Queen Elizabeth. His father, Emperor Ferdinand I expected Elizabeth to be okay with Charles of Austria to rule England if she died childless. As with all of her other suitors Elizabeth dragged out the negotiations – most likely knowing all along that she would not agree to marry. As with many of her suitors religious beliefs were an issue with the Catholic Archduke. Negotiations lasted many years as Elizabeth played suitors off against each other and tried to keep everyone happy. “Thanks for his good will and the offer of his son in marriage. Can only speak with her mouth as she finds in her heart, “which is truly no certain inclination or disposition to marriage, but rather a contentation to enjoy and continue in this unmarried life.” Yet as the nobles and other states of the realm are therein somewhat importune, she will not therefore make any precise determination or vow to the contrary. Should she hereafter like of marriage and alter her mind, she trusts, by God’s favour, to make no choice but of such one as shall be both very honourable and not unlike to her own estate, nor unmeet for these her kingdoms. Is not better affected to any house or family in Christendom than to the house of Austria. Francis was the son of King Henry II of France and Catherine de Medici, born in 1555. No, not the Francis that was Mary Stuart’s first husband, his younger brother who was born Hercule Francois. His name was changed in honor of his late brother when he was confirmed. In 1579, Jean de Simier arrived in England (on 6 January) to negotiate a marriage between Queen Elizabeth and the Duke of Anjou. Council members took in all factors as to whether or not the marriage would be beneficial to England. They were divided. The Duke of Anjou had courted Elizabeth from 1578-1581 without success. Elizabeth seemed very interested in Francis and even called him, ‘her little frog’. Even though they were separated in age by two decades (he was only 24) the two became very close. Unfortunately the opposition of some of her Councillors and concerns from her subjects over a french takeover led her to end the courtship – she would have no more suitors. Or die, and so forget what love e’er meant. ²’Elizabeth: June 1559, 26-30′, in Calendar of State Papers Foreign, Elizabeth, Volume 1, 1558-1559, ed. Joseph Stevenson (London, 1863), pp. 337-346 http://www.british-history.ac.uk/cal-state-papers/foreign/vol1/pp337-346 [accessed 9 December 2015].